Get a real competitive edge by offering LifeLock as an essential employee benefit. 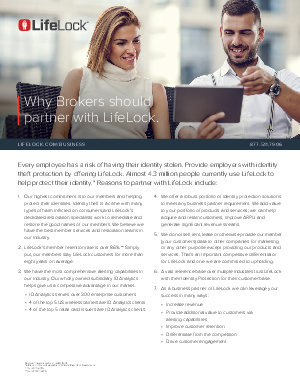 LifeLock offers a robust portfolio of identity protection solutions to meet any business partner requirement. We add value to your portfolio of products and services; we can help acquire and retain customers, and we help improve ARPU and generate a significant new revenue stream.